Brian Cox is an award-winning actor of the stage, screen and television. He has appeared in dozens of plays on the stages of London, New York and Scotland. Cox earned AFI and Independent Spirit Award nominations for his work in the critically hailed independent film L.I.E. and also shared a Screen Actors Guild Award nomination as part of the ensemble cast of Spike Jonze’s Adaptation. His most recent film credits include roles in Churchill, The Etruscan Smile, Super Troopers 2, Morgan, The Carer, The Autopsy of Jane Doe, Red 2, Coriolanus, Rise of the Planet of the Apes, The Campaign, and Blood. Additionally, he has appeared in The Good Heart, Tell-Tale, The Escapist, Troy, X2, Zodiac, 25th Hour, The Bourne Identity, The Bourne Supremacy, The Ring, Red, The Rookie, The Affair of the Necklace, For the Love of the Game, Rushmore, Desperate Measures, The Boxer, Kiss the Girls, Braveheart, Rob Roy, Manhunter, Hidden Agenda, and Nicholas and Alexandra. In Fall 2015, Cox starred in a new production of Waiting for Godot, for the 50th Anniversary of Edinburgh’s Royal Lyceum Theatre. Cox was one of the original performers in the Lyceum’s first ever production in 1965, The Servant o’ ‘Twa Maisters. He was only 19. 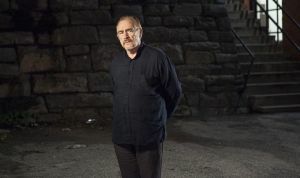 Cox has collaborated with award-winning playwright Conor McPherson on several productions, most recently The Weir, which Cox starred in at the Donmar Warehouse. They also collaborated on Dublin Carol, in which Cox starred as grim alcoholic undertaker John Plunkett. Repeatedly honored for his work in the theatre, Cox won two Olivier Awards for his performances in Rat in the Skull and Titus Andronicus; British Theatre Association Drama Awards for Best Actor for his work in The Taming of the Shrew and Strange Interlude; and the Lucille Lortel Award, as well as Drama Desk and Outer Critics Circle nominations, for St. Nicholas. He spent eight months in London’s West End, starring as Max in Tom Stoppard’s Rock ‘n Roll, a role he reprised on Broadway. Cox was also seen on Broadway in The Championship Season. Cox has also helmed stage productions of I Love My Life, Mrs. Warren’s Profession, The Philanderer, The Master Builder, Richard III and Julius Caesar. Cox’s recent television credits include Succession for HBO, Medici: Masters of Florence for Netflix, Penny Dreadful for Sky, War and Peace for BBC, NBC’s The Slap and BBC America’s The Game, as well as Bob Servant, the British miniseries The Sinking of the Laconia, The Day of the Triffids and The Take, and a guest-starring role on Showtime’s The Big C. He received a 2001 Emmy Award for his performance as Hermann Goering in the miniseries Nuremberg, and was also nominated for Golden Globe and SAG Awards. He also earned an Emmy Award nomination for his guest appearance on the comedy series Frasier, and co-starred in the third season of HBO’s acclaimed original series Deadwood. Cox made his television directorial debut for the hit HBO prison drama Oz. He is the author of two books, Salem to Moscow: An Actors Odyssey and The Lear Diaries. In 2003, Cox’s contributions to the arts were honored by Queen Elizabeth II, who named him a Commander of the British Empire. In 2006, Empire Magazine honored his film achievements with the Empire Icon Award and, in 2007, the UK Film Council named him one of the Top 10 powerful British film stars in Hollywood today.